From FMCG = Faster-Moving Content Giants?, can FMCG now also stand for Faster-Moving Community Groups? 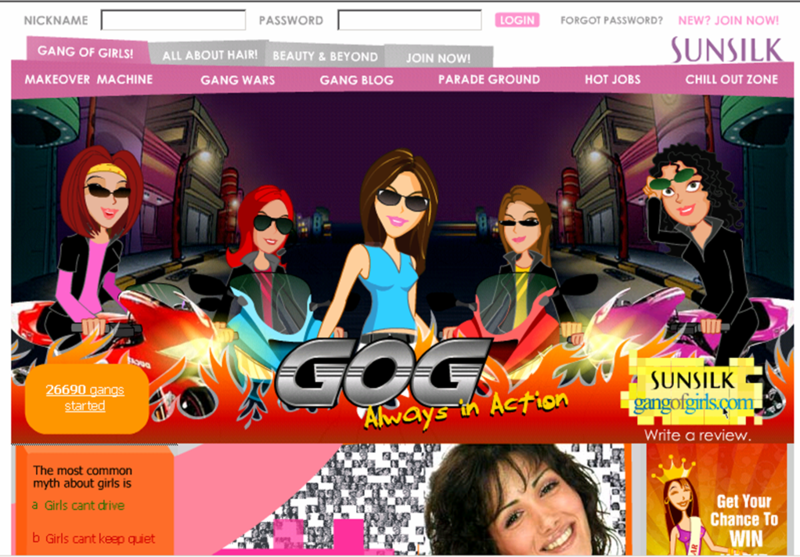 Log on to sunsilkgangofgirls.com to fathom the growing power of blogging and community in India. The move by Sunsilk India to jump onto the digital medium is a step towards handing of baton to the consumers, as The Big Switch gathers strength. It answers a simple consumer need to belong and share – “Girl Bonding”. To provide a brief background, the site was launched in June 2006 through a complete 360 communication channel plan, for the college girls of India. It hosts an array of vibrant, exciting content (credits to our print and online media partners) and is rooted in consumer insights. What started out as a “consumer insight led site” is today a “consumer response driven site”, and is picking up momentum. Consumer feedback propels the content, look and feel, and nature of activities. With thousands of registrations a day, and a registration base of 350,000 since mid-year 2006, this is meeting consumer acceptance. There are also more than 26,000 registered ‘gangs’ now. Some of the myriad opportunities which lie ahead – a nucleus site to aid understanding of the target segment…the single most effective channel to reach the target…direct consumer feedback and advice on product development, campaign development…a movement towards “co-creation”. The brand has seen results, in off-takes as in perceived value, without a single promotional offer on the site. Tomorrow, consumers can take over the site completely … run it as they rule it today. Our team – Unilever India, JWT and Mindshare – has enjoyed every moment, from conception to launch, of the site and is thrilled by its growth. We welcome your views on it. Can FMCG marketers hand over the reigns to the consumer? Note: Flip through “Future of Competition: Co-creating Unique Value with Customers” by C.K. Prahlad and Venkat Ramaswamy. This book explores the growth in consumer power over multiple cases. Entry filed under: india, media general.